What Are You Finding on Tensile Structure Feel Free to Tell Us We Will Help You. Established in 1998, Ekra Decor Pvt. Ltd. is one of the Indian market leaders in high quality tensile structure, membrane structures, shade structures and related fabric works. Ekra Decor work along with their clients throughout the entire process from design, sail fabrication, steel fabrication, installation, as well as providing post-sale services such as repairs, cleaning and maintenance. It looks completely stylish and provides better shade on installed. They are generally used by the structures associated with religious . We take extra care in manufacturing them to serve utility of out customers. These translucent tensioned membrane structure fabrics carry from seven . Ekra Decor Pvt Ltd. is one of the prominent organizations in construction of tensile structure. We design and manufacture all type of permanent and temporary membrane fabric structure since 1998. We have in house M & A Steel fabrication and membrane heat-sealing facility. We also have in house spray painting facility for M. Steel framework. Rather than acting us booking agents for companies abroad we worked with consultants to design and develop tensile structure, membrane structures in India. Having the structure developed in INDIA saves a lot of foreign exchange for the country it also saves a lot of cost and time. Tensile structure is the term usually used to refer to the construction of roofs using a membrane held in place on steel cables. Tensile structure is the building blocks of tension of membrane to provide various deign of roofing. This is new and innovative idea of structure and roofing methods. Tensile fabric structure are soft, translucent, light and long lasting way of structure which takes less time in construction. The tensile structure includes tensile structure fabric and tensile structure membrane. Tensile structure is suitable for all types of structure for roofing. 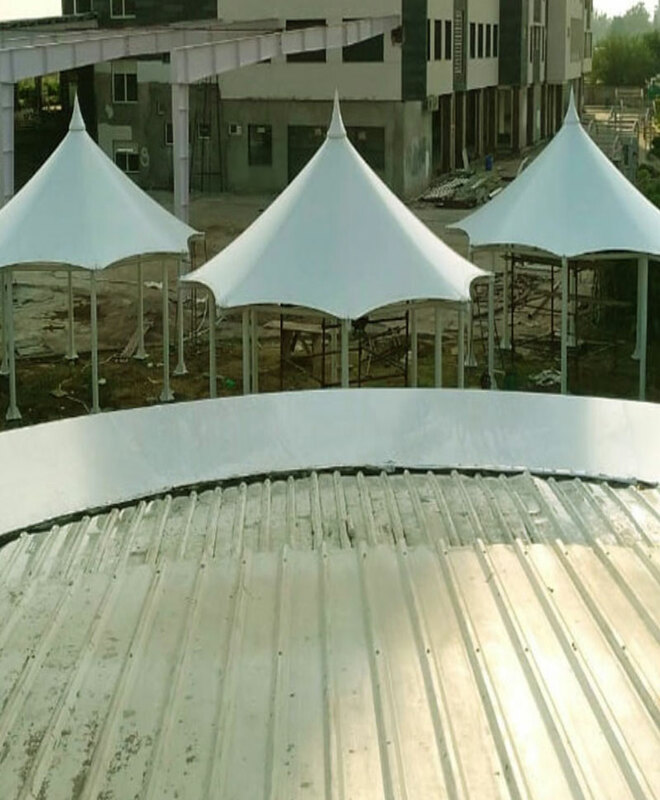 Tensile architecture provides solution for walkways, stadium, exhibition, entrance, parking, swimming pool, hotels, retail, roofing and other places as per requirement. The tensile fabric and tensile membrane used to make it is of high quality. The material used in tensile structure includes Teflon, cable, fiber, polyester cloth, PVC and other are durable. Tensile structure consist very strong element that sustain for very long time and do not effect sunlight, heavy rain, wind and these are easy to clean. Tensile structures are highly in demand due to its feature. These are flexible enough to provide various types of structures requires for different places. These are light weighted so easily taken for various places of construction. It is cost effective and will take less cost of maintenance. The tensile structure can easily provide different types of structure includes stayed structure, suspended structure, anticlastic structure, pneumatic structure, trussed structure. Tensile structure are very beneficial at different places auditorim, stadium, walkways, resort, hotels, café, mall, car parking, theater, swimming pool, patio shadow and other commercial and living places. These can be used for temporary basis as for tents. The material used for it is long lasting and can be recycle. These element are water proof and resist from fire. These takes less time in cleaning and east to clean. We design and manufacture all type of permanent and temporary tensile structures since 1998. The tensile structure is the basic construction of elements that are carried only via tension without any bending or compression. The most common tensile structures in Delhi india are available on thin-shell structures. As it is economically feasible it is considered as the best choice for a roof. They can even get expanded to large areas that also gives an attractive look. There are different tensile structures which can be subjected to compression or bending elements like that of compression rings and masts. In recent days there has been a huge demand for these types of roofs. It is available for a reasonable price along with uncompromised quality. Moreover, it has the lightweight texture, reflective properties, translucent along with environmental adaptability features. There are different varieties of tensile structures available depending upon the basic use of it. One of the most common types of a tensile structure in India has been presented by a two-dimensional fabric membrane. It has the ability to take planar tensile forces which cannot withstand the force which is perpendicular to it. However, to withstand the tension it needs to take three-dimensional formation which attains maximum stability. The most common type of shapes includes, Anticlastic Shapes: This shape is created by examining the principal curvature on the opposite sides of the fabric. If the load increases at a particular point, then the tension also increases leaving the other side. So as to maintain the structure, there are different types of frames supported in each phase and the most common shapes include cone and saddle. Synclastic Shapes: This is characterized by the red eye of the principal curvature which is balanced on the same side of the fabric. So as to withstand the external force, it needs to use some unique specifications. In most of the cases of The structures are utilized in air-inflated formations. The use of tensile fabric structures can be adopted in various situations. When compared with traditional structures they utilized less material equipment for giving lightweight complexion and are very easy to transport. In addition to that, they also have the flexibility to meet the demands. Being light in weight they can easily find used in different structures like skylights, canopies, atrium roofs, etc. It is used as a different form for conventional buildings so as to provide a showpiece element. It can easily facilities by using column-free span or wide spans as well. When there is a need for modular buildings along with metal frames. In case if the building needs to move from one location to another. Q.2 - How long will a tensile structure last? Q.3 - When to use a tensile fabric structure? Q.4 - Where to use a tensile structure? Tensile fabric structure - A structure that is characterised of the membrane system (typically with wire or cable) to provide the critical structural support to the structure. It can hold many forms, although it is generally based on two basic building blocks - The Saddle and The Cone. This creates dramatic and structural architectural works, offering a wide variety of free form design and roof structures. The tensioning of the fabric eliminates any creases in the fabric and creates the strength for the material to withstand any severe weather and potential damage. How long will a tensile structure last? This will depend on the materials used. So 35-40 years if you specify a PTFE or silicon coated glass cloth - otherwise 15-20 years for PVDF coated membranes. The structural steel frame and cables should perform upwards of 40 years. To keep the structure looking at its best and operating safely, some routine bi-annual maintenance will be required. When to use a tensile fabric structure? 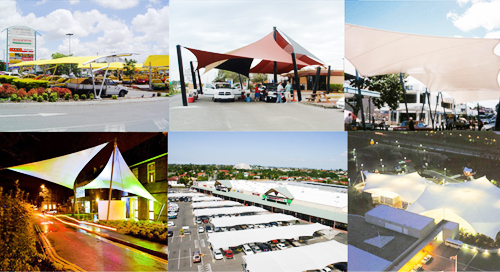 Tensile fabric structures can be used in a variety of situations. They use less material than traditional structures and as a result, they weigh less and are easier to transport. 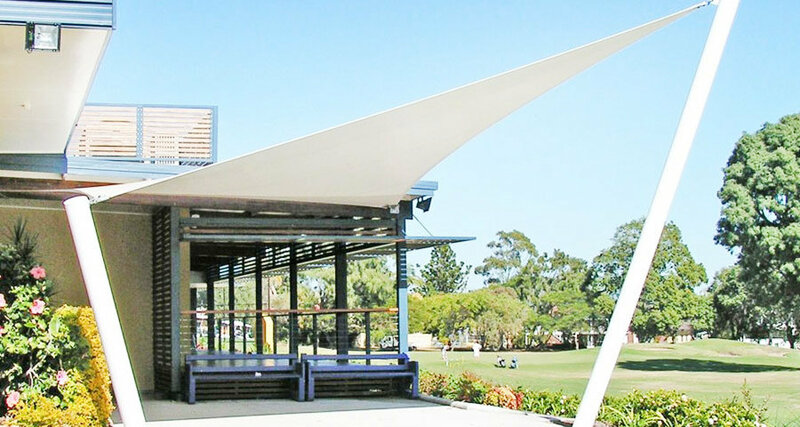 They are flexible and can be specifically tailored to meet your requirements and provide shade or shelter. In addition to the required practicality elements, tensile fabric structures are a showpiece feature that offer an impressive focal point. Where to use a tensile structure? When you need a showpiece element that stands out and is different from conventional buildings. This can be as a signature urban object or a building icon. When you need a wide span or column free span. Tensile fabric structures can span unsupported lengths of up to 150 feet and tensile steel cable nets with fabric can easily span twice that amount. Air structures can span even longer distances with column free structures up to thousands of feet. When your building has to move from one location to another during the lifespan of your facility, such as temporary schools, travelling exhibits, etc. When you need a prefab modular building. Metal frame with tensioned fabric panels are the most cost effective modular frame buildings available today. As lightweight additions to existing or conventions buildings, tensile structures can act as canopies, skylights, covered walkways, shading systems or atrium roofs. © 2009-2019 all right reserved. powered by Ekra Decor Pvt Ltd.